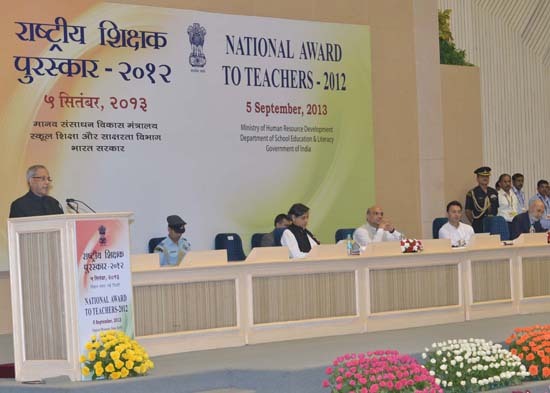 It indeed a privilege for me to be present here and to address you on Teachers’ Day. I am happy to join you on this occasion when we recognise and celebrate the dedication of the teaching community in India. It is a day when we honour, with these national awards, those of you who have contributed in an outstanding way in the field of school education. I congratulate you as I greet all the teachers of our country and express the collective gratitude of our nation for your service and commitment. I take this opportunity to recognize the efforts of motivated private and non-governmental organisations for their admirable initiatives in extending education. The people of India value your contribution to the building of modern India. It is only appropriate that the birth anniversary of my pre-eminent predecessor, Dr. Sarvepalli Radhakrishnan, is celebrated as Teacher’s Day. It is our nation’s homage to this luminary among modern India’s greatest philosophers. He was a mentor and a revered guide to educationists setting the academic priorities of modern India. He had believed and I quote: "The aim of education is not the acquisition of information, although important, or acquisition of technical skills, though essential in modern society, but the development of that bent of mind, that attitude of reason, that spirit of democracy, which will make us responsible citizens” (unquote). These inspiring words encapsulate the essence of his approach to education. It reminds us, even today of the need to constantly introspect and innovate to reorient our teaching content and methodology in response to the changing times. We should always be guided by the primary aim to make our children self-confident, self-reliant and responsible Indians. A sound education system is the bedrock of an enlightened society. It is the cornerstone on which a progressive, democratic society is built - where rule of law prevails, where there is a high degree of civility and respect for the rights of others as well as our own. A good education inculcates the habit of tolerance of divergent views and opinions. A good education makes us spiritually calm. It inspires us to use our learning to indulge in healthy debate rather than enter into conflict with those who disagree with us. A good education teaches us to use our learning for the good of mankind – rather than against it. A society can be described as "advanced’’ if its people have learnt to address dissent with understanding and with a desire to achieve harmony. Since we won our independence, we, in India, have done very well in the fields of science, technology, innovation and economic development. Yet, we find that despite our accomplishments, we cannot claim to have evolved into a truly developed society. Development is not only about factories, dams and roads. Development, to my mind, is about people, their values and their faithfulness to their spiritual and cultural heritage. As we move forward, it is a holistic education that should play a definitive role in shaping our values. Here, I see a pivotal role for the teachers in re-setting the moral compass. The teachers have to help our youth imbibe the essential civilizational values of love for motherland; performance of duty; compassion for all; tolerance for pluralism; respect for women; honesty in life; self-restraint in conduct, responsibility in action and discipline. There was a time when we had renowned seats of learning like Takshashila, Nalanda, Vikramashila, Valabhi, Somapura and Odantapuri. They attracted scholars from far and wide. The powerful minds who taught at such universities created an exalted position for our ancient education system. We have to regain our leadership position. We look towards teachers to guide the way. I am confident that there is a greater awareness in the entire teaching community of the need to fine tune the curriculum and adapt current methodologies to create relevant and effective approaches to teaching and learning. We need to create systems for continuous assessment of the quality of education and the outcome of our educational inputs. Participation of the community and parents would be essential in this process so that all stakeholders can ensure the desired results. A strong spirit of enquiry is a key ingredient in gaining better insights and all these contribute to the making of a rational, free thinking and progressive individual. An inclusive approach is critical for achieving our developmental goals. We have to empower our children, their parents and communities in every part of India. They must be afforded the opportunity and the ability to change their lives at a pace that they find is appropriate and beneficial. A key objective is to close the male-female gap in literacy. Nothing is more saddening than the sight of a girl child being denied education. I take this opportunity to reiterate the motto, "All for knowledge and Knowledge for all”. We know that students see their teachers as role models. We, in India, are inheritors of a sacred tradition in which our gurus, saints and seers have selflessly nurtured our minds and shaped our intellect. Imparting knowledge, has, down the ages, been a very methodical, painstaking and sacred transaction in an atmosphere of trust and reverence. It is ingrained in us to believe that while our parents give us life, it is our "gurus” that shape our character and aspirations. Nikos Kazant-zakis, the Greek writer and philosopher, had said and I quote: "True teachers are those who use themselves as bridges over which they invite their students to cross; then, having facilitated their crossing, joyfully collapse, encouraging them to create their own” (unquote). Our educational institutions have such teachers who can shape the thoughts of the young minds. Through words, actions and deeds, such teachers inspire the students and elevate them to a higher level of performance and thinking. They help to inculcate correct values in their students. Such inspired teachers should be encouraged to share their knowledge, wisdom and philosophy with the larger student community. With these words, I once again call upon teachers to stay firm on the path of leading India forward to its next golden age. I thank you all once again and wish you every success.